Artist of the moment: I figured I should probably honour the continuity of my previous artist micro-blurbs to hold consistency to my rantings (or lack thereof). 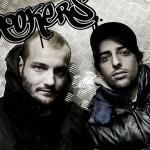 This time I would like to mention my most favorite DJ duo of recent time, Crookers! (Or, in proper Italian accent, crew-cairs!). Crookers (the Crookers? ), are 2 dudes, Bot and Phra, and they're signed, of course, to my favorite DJ's record label, Mad Decent Records. I love these guys cuz their sets are a non stop flurry of bass pounding, energy charged, Fidget House. Fidget House is of course an unofficial term coined to describe this frantic, cut-up, House music style. I still like the term Electro Crunk, because the music sounds pretty Electro and Crunky to me. I guess Crookers sort of traverse a range of styles in their mixes and sets. 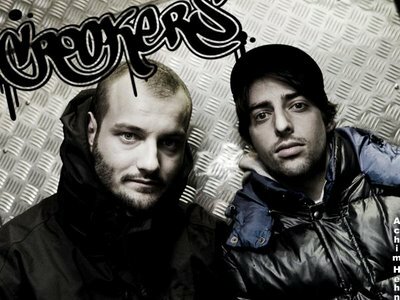 If you want a good primer on Crookers, I'd start with their Radio 1 Essential Mix if you can get a hold of that. It's basically anything and everything they'd done up to that date with some other stuff thrown in. Incredible! ..................................................................... So, I've been pulling my hair out, yet again, due to the uncalled for complexity presented by CSS coding techniques. I mean CSS is actually a very simple language, and very easy to pick up and learn. The difficult part is learning how to use it PROPERLY. I love the many facets of design and putting my creative juices to the test, but when it comes to stylizing webpages and lining up it's rigid skeletal grid to hold all of the content precisely where I want it, I'm completely stumped. Don't get me wrong, I know this isn't an easy task, learning such a muddled and conflicted language such as Cascading Style Sheets. It's had such a torrential history, I suppose, being used in different ways by different browsers for sometimes different purposes.